Just Another Day...: Bad Mommy! WARNING: This post contains graphic images. Well, they're graphic if you're like me and you don't like to see grody skin conditions. Proceed at your own risk. Gross, right? It looked almost like a burn or something. I asked her how it happened, if she hurt it somehow and she said she didn't know what happened. For the past 2 weeks, we've just cleaned it out with peroxide, treated it with Neosporin and slapped a band-aid on it. I asked her if it hurt at all and she (surprisingly) said no, so that made me feel a little bit better. I called her pediatrician and made an appointment for that afternoon. Ugh. The doctor diagnosed her with paronychia, which sounds really bad but it is essentially a skin infection that occurs around the nails. 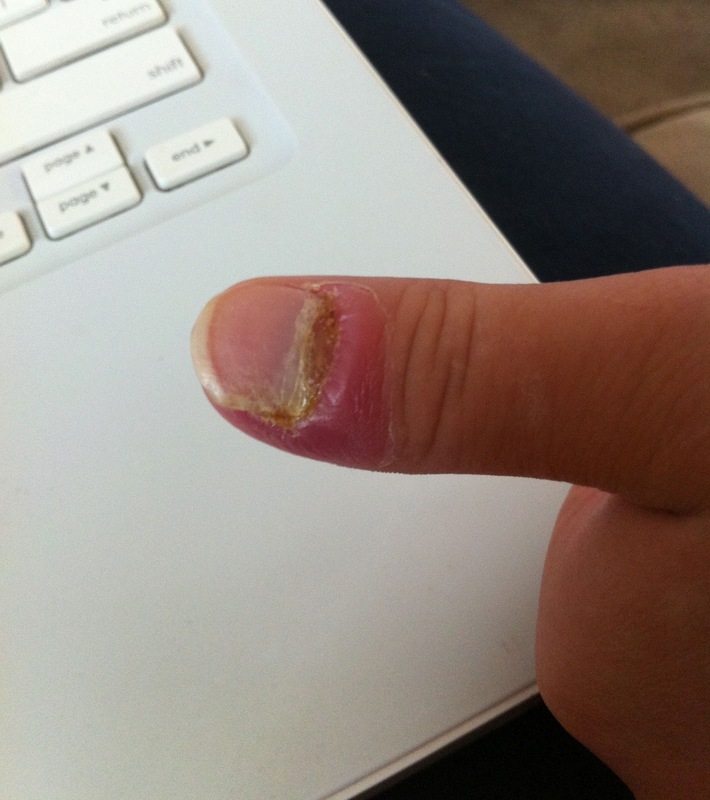 She put her on a hefty antibiotic for 10 days, which should help to decrease the swelling and redness, as well as eliminate any kind of "oozing" from the nail. 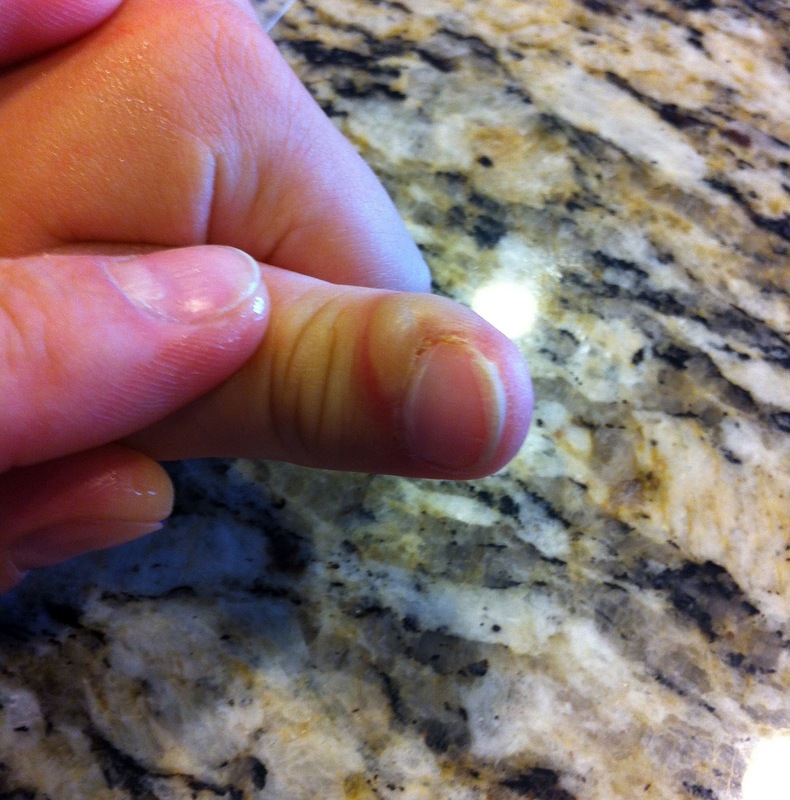 The doctor also mentioned: SHE WILL PROBABLY LOSE HER FINGERNAIL. I gasped like a crazy person who was just told her daughter will lose her THUMB. I just figured you only get one, and if it's gone, it's gone!! But alas, the doctor calmed my fears by telling me it WOULD grow back. But OMG! I can't believe I waited until my daughter got into the "she-might-lose-her-nuggin'-fingernail" phase of an illness/infection before mommy finally did something about it. I'm so mad at myself!!!!! I know all of this is temporary, and she's not in pain so that helps, but still. What kind of mommy am I? ?